DENVER--(BUSINESS WIRE)--MNG Enterprises, Inc. (“MNG”), owner and operator of one of the largest newspaper businesses in the U.S., with approximately 200 publications, today announced that its board of directors has sent a letter proposing to acquire Gannett Co., Inc. (NYSE:GCI) (“Gannett” or “the “Company”) for $12.00 per share in cash. The proposed transaction would represent a cash premium of 41% to the Gannett stock price as of December 31, 2018, and MNG has asked Gannett to enter into discussions with MNG immediately about a strategic combination. MNG also requested that Gannett immediately commence a review of strategic alternatives to maximize shareholder value, commit to a moratorium on the acquisition of any additional digital assets, and commit to a feasible, strategic and financial path forward before hiring a new CEO. 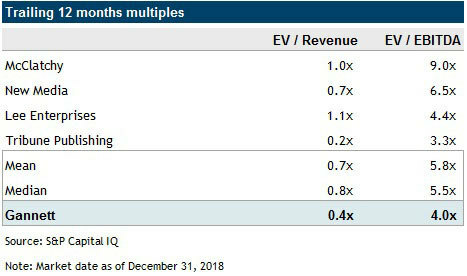 Gannett has lost 41% of its value since its debut as a public company two and a half years ago, significantly underperforming its peer group and indices. [i] During this period, Gannett suffered from a series of value-destroying decisions made by an unfocused leadership team – overpaying for a string of non-core aspirational digital deals and pursuing an ill-fated hostile for Tribune Publishing, all while Gannett’s core revenue, EBITDA, margins and Free Cash Flow continue to decline. With Gannett’s CEO departing by May and its key digital executive leaving later this month, there’s now an even greater leadership void. Frankly, the team leading Gannett has not demonstrated that it’s capable of effectively running this enterprise as a public company. Gannett shareholders cannot sit by and watch further value erode while the Board casts about for a strategy and a leader, especially when there is an opportunity to maximize value right now. We believe Gannett shareholders deserve better. 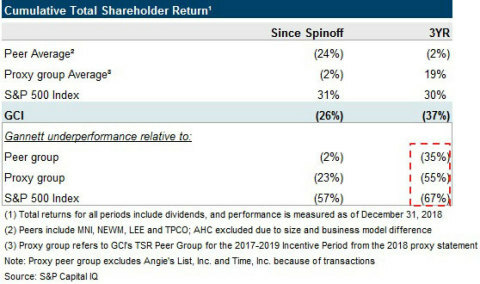 MNG’s proposal to buy Gannett for $12.00 per share in cash, represents a 41% premium to where the stock closed at YE 2018. [i] Such an acquisition, subject to confirmatory due diligence, would provide a substantial premium over Gannett’s $8.53 closing price on December 31, 2018 and its closing price of $9.75 on January 11, 2019, and would provide compelling and immediate cash value for stockholders. Further, unlike other potential buyers, as a proven operator in the newspaper business, we are able to provide a home for the Company’s businesses and valued employees so they can continue to serve their local communities. We do not believe that any material regulatory issues would stand in the way of completing this transaction. [i] Based on closing price as of December 31, 2018. 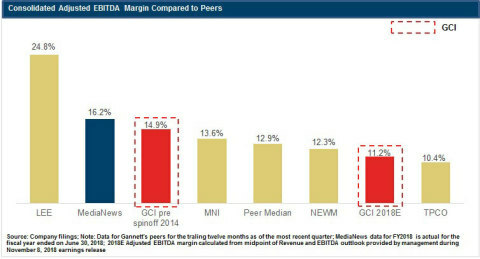 [ii] Gannett’s Publishing segment Adjusted EBITDA contribution to the Consolidated Entity is measured after allocation of Gannett’s Corporate and Other segment Adjusted Expenses on the basis of the segment’s revenue contribution; Data for the trailing twelve months as of September 30, 2018. [iii] Gannett’s Consolidated Adjusted EBITDA of $472mm in 2014 as disclosed in Company filings and $328mm as the midpoint of the outlook range for 2018 Adjusted EBITDA as included in earnings release on November 8, 2018; Gannett’s Free Cash Flow of $247mm in 2014 as disclosed in 2015 10-K and $145mm on a trailing twelve month basis calculated from Company filings. [iv] Gannett’s acquisition of ReachLocal for $162.5mm and SweetIQ for $31.8mm as disclosed in the Company’s 2017 10-K; Gannett paid approximately $145mm in cash to WordStream’s equity holders as disclosed on July 2, 2018; Further consideration to WordStream included up to an additional $20mm in potential cash earn-out payments based on WordStream meeting certain revenue targets and up to $6.4mm in cash payable upon the release of the escrow and expense holdbacks.